In 1753, a committee of the Kirk session decided to provide indoor accommodation for the poor of the parish of Ayr. The poorhouse, erected in 1756, was located at the junction of Mill Street and Smith Street near the present railway bridge. The poorhouse site location and layout are shown on the 1875 map below. At its opening, 9 men and 15 women were admitted to the poorhouse. Following the 1845 Poor Law Act, the site passed to the Parochial Board. However, it soon became apparent that the premises were inadequate and Ayr subsequently joined other parishes to form the Kyle combination. In 1857, construction of the Kyle Combination poorhouse began a few hundred yards away on Holmston Road. The former poorhouse site is now occupied by Church of Scotland flats. 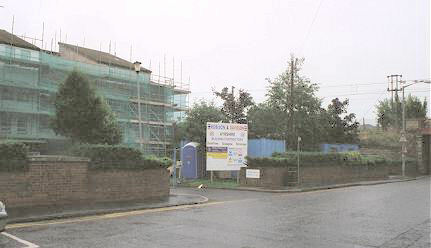 Ayr former poorhouse site from the west, 2001.